Rhomps are a rolling species of Thwomp that first appeared in Super Mario Galaxy 2. They are only found in the sand slide area of the Slipsand Galaxy, where they attempt to flatten Mario, which kills him instantly, no matter how much health he has. 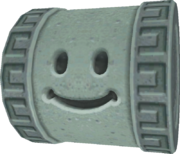 They resemble tube-shaped stones with smiley faces and a circular stone with square designs on it attached to each side. They are similar to Spindels in both design and behavior, but have several differentiating features, such as smooth stone skin and no teeth or eyebrows. This page was last edited on December 16, 2018, at 02:59.